"Two is Company" - A&R featured in Clavier Companion! 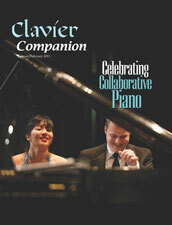 We're on the cover of this month's "Clavier Companion." The corresponding article is spot-on: Nick Romeo (the author) actually "gets" us, our mission, and our artistic pursuits, and he swirls it all together into a mighty read! Kudos to Nick! We need batteries, duct tape, and a flashlight,” said Greg Anderson, a doctoral candidate in the piano department at Yale University. Greg and I were walking to a thrift store in downtown New Haven with Elizabeth Joy Roe, Greg’s friend and partner in the Anderson & Roe Piano Duo. “Are we going to be destroying anything in slow motion?” Liz asked, in a serious voice. “We can bring that lamp I don’t want,” Greg said. Arriving at the New Haven Salvation Army, they fanned out and searched the aisles for flared jeans, bell bottoms, tapered shirts with pointed collars, anything reminiscent of the 1970s. Greg found a marigold shirt with a brown floral pattern and a pointed collar that fit him perfectly. He made for the register. “I haven’t seen one of these in a long time,” the cashier said as he counted out change. In a few hours, Greg and Liz were shooting footage for a music video of their two-piano paraphrase of the Bee Gees song Stayin’ Alive.